When I saw Spooky Singles for sale in my local supermarket I was compelled to purchase them, on the understanding that the contents of the package was something of ghostly or otherwise supernatural origin. So on a thunderous, rain-swept night I drew the pentagrams, lit the black candles, and recited ancient dead languages before opening the scary packet on the stroke of midnight. 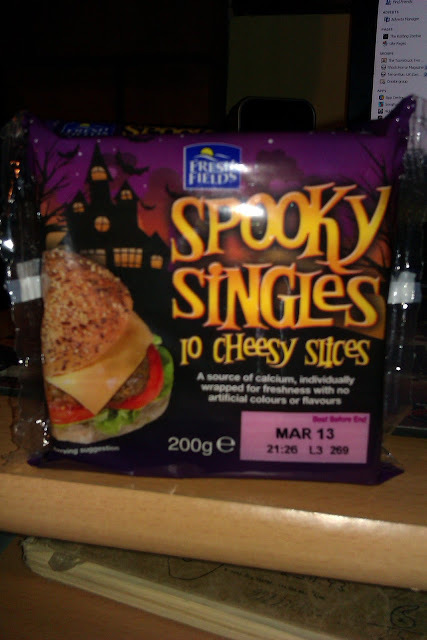 I must say I was kind of disappointed that there was actually no difference between 'Spooky Slices' and normal cheese slices. If your after a fright night feast then stick with the boiled razorblades and avoid this let down! If you are actually after cheese slices, then by all mean add more Rotting Zombie heads onto that score.